In honor of my two sisters coming into to town, I made Beef Stew with Leeks and Vermouth. It’s a 2-day process that involves big words like ‘deglazing liquid’. It’s pretty awesome. Sure it takes a long time. Sure it takes up loads of room in your fridge. Besides, R eats blueberries BY THE FISTFUL. It’s pretty crazy how she hasn’t turned into a round purple girl like in Willy Wonka…Veruca Salt? Was that her name?? Meat fell apart in my mouth! Step 1 – The Meat3 lbs. of boneless meat **I used 2 lbs. 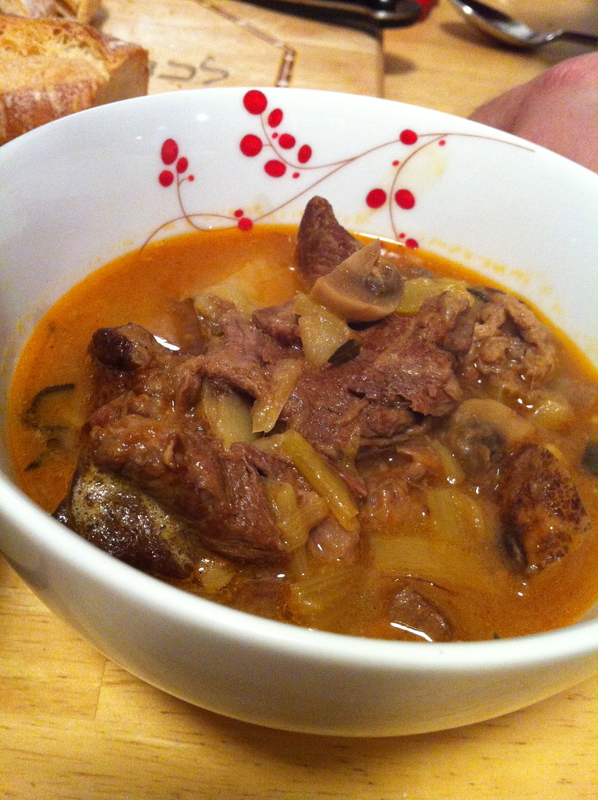 of Chuck today – NOT “stew meat”, whole meat that I cut up. I’ve been reading a lot of Stew Recipes lately and they all seem to suggest that. They say that cutting it allows you more control. 3 Tablespoons of Vegetable Oil **Today I actually used Olive Oil. Step 2a – The Aromatics 1 medium Yellow Onion, coarsely chopped **I used a Leek. I had it on hand. 1 medium Carrot, coarsely chopped **I used a handful of baby carrots. Just because. Hardy Fresh Herbs (Oregano, Rosemary, Thyme, Sage, Marjoram or a mix): minced, 1 Tablespoon **I used Fresh Thyme. Leeks and Vermouth = YUMMY! 1- Brown the Meat: Rack on the bottom third of the oven and heat to 325ºF. Spread your newly cut meat out on paper towels and pat dry. Leave out for 10-20 minutes so they dry even more. In your large, heavy-bottomed pot you’ll heat your oil until it’s shimmering. Add about 1/3 of your dried meat cubes into the oil – make sure they’re laid out in a single layer and there’s no crowding. We want browned meat, not steamed gray chunks. Brown all the sides well – this should take about 10 minutes. Transfer the meat to a large bowl or baking sheet and let cool for a few minutes. 2- Cook the Aromatics: Pour off all but 2 Tablespoons of the fat from the pot. Add the onions/leek, carrots and celery to the pot. Season with a pinch of salt and pepper. Cook, stirring often and scraping the bottom of the pot with a wooden spatula, until the veg begins to soften, 5-6 minutes. Stir in the Flavor Accents: Stir them in and cook, stirring occasionally, for 1-2 minutes, until fragrant. 3- Add the Liquids: Add the deglazing liquid, stirring with the wooden spatula that seems ubiquitous across all recipes. Raise the heat, bring to a boil, cook away until it’s reduced by half (5-8 minutes). Add the Stewing Liquids: Dump them in and bring to a boil. Begin Stewing the Meat: Return the meat (& all accumulated juices) back to the pot. Crumple a 12×16″ piece of Parchment Paper, then flatten it out (crumpling makes for easier handling). Place the parchment directly on the surface of the stew, allowing the edges to come up the sides of the pot. COVER and whack into the oven. 4- Add the Vegetables: After one hour of cooking, I added in the slow cooking potatoes and carrots. After 30 minutes more, add in the leek. Cook for another 1/2 hour to 1 hour, depending on your oven. Check it every 10 minutes or so, for doneness. 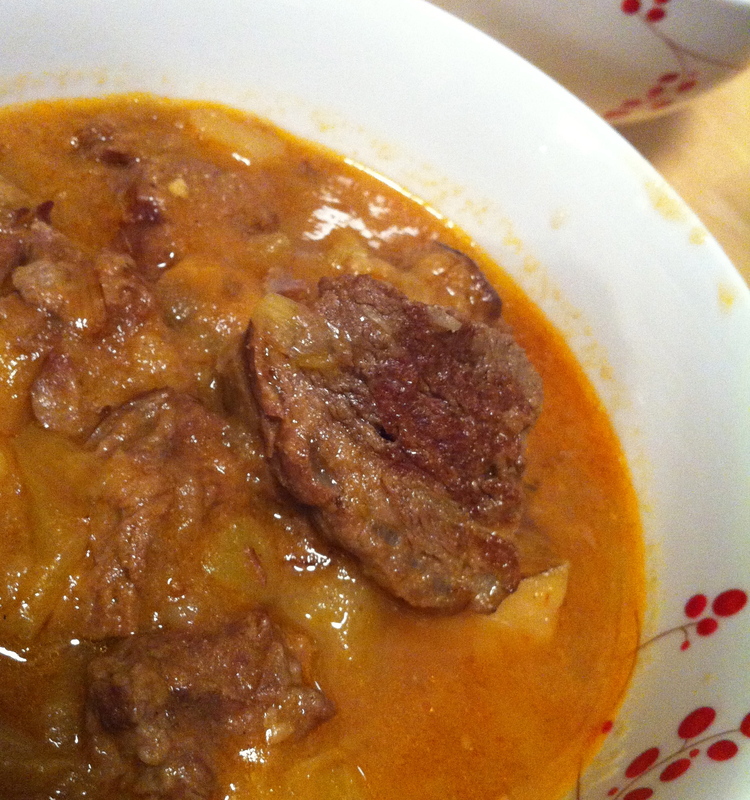 I figured out doneness by tasting the broth and chunks of meat. 5- Finish the Stew: Add stuff at the very end to make your stew even more amazing. If you forget, it’s not a big deal. Just shrug your shoulders and don’t tell anyone. 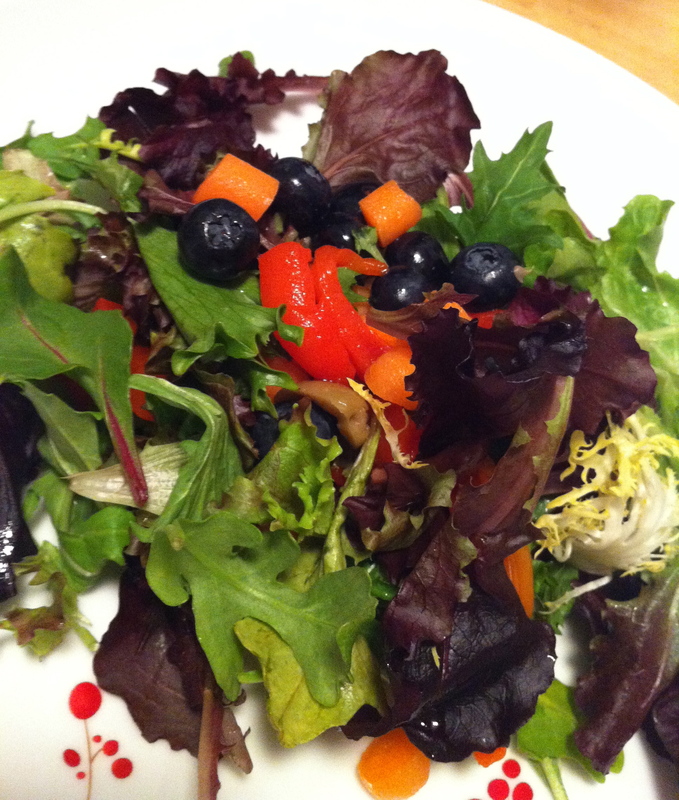 I put blueberries in my salad. I’m not gonna bother recipe-izing this one. I dumped salad in a bowl. Topped with roasted peppers from a jar, cut in strips, and some jarred olives and a heaping handful or two of blueberries. Oh and I chopped up a few baby carrots. Just because. You should eat more salad. Of course, you could be like little R. All she ate for dinner was blueberries. Lots and lots of blueberries. Perhaps I should call her Veruca Salt. Before I forget – at dinner tonight, the restaurant served PICKLED GRAPES. I asked the chef for the recipe – and he GAVE IT TO ME! I can’t WAIT to give these puppies a try!